Are you eligible to migrate to Australia? The Australian Government has a tough immigration policy and strictly controls who enters the country by requiring everyone who is not an Australian citizen to have an entry VISA. Our immigration policy is not static, however. It is frequently modified and adapted to match changes in social and economic conditions in Australia. There are many categories under which you can be granted a visa for entry to Australia. For the purpose of migration, however, the number is fairly limited - though working out which visa is the right one, or the best one, for you is likely to be pretty complicated. 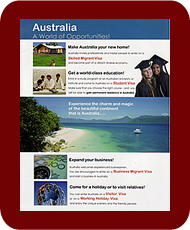 aiming to get Permanent Residence in Australia, this page is not the right one for you. Please visit our web page for international students like youYou are special because you may be uniquely eligible for one of Australia's ONSHORE VISAS: click for details. To find out if you are eligible to emigrate to Australia, click on the Migration Visa category below that looks most promising to you and find out what your options are. For most visitors to this site that is likely to be the Skilled Visas category, but you may be lucky enough to be able to apply for an Employer-Sponsored Visa: these days the easiest and fastest route to a Skilled Visa is THE OFFER OF A JOB IN AUSTRALIA. Employer-Sponsored Visas, for skilled people with recognised qualifications and skills or experience in particular occupations, who are seeking to work on a temporary or permanent basis for an Australian (or overseas employer based in Australia) who is willing to sponsor them. This visa category receives the highest priority in terms of the processing of migration visa applications by DIAC. have been invited to do so by the Australian government in response to an Expression of Interest you have lodged through SkillSelect. Business Visas, which targets people under the age of 55 who have a demonstrated record of business or investment success and who are committed to using their business and/or investment skills in Australia. You can only apply for a Business Visa if you have been invited to do so by the Australian government in response to an Expression of Interest you have lodged through SkillSelect. Family Visas, designed for Australia's Family Migration Program, in which people are selected on the basis of their family relationship to a sponsor in Australia. As a general rule, to settle permanently in Australia as a Family Migrant, you must be sponsored by an Australian citizen or resident who meets certain conditions. Onshore Visas for eligible International Students who have gained an Australian qualification as a result of at least two (2) years full-time study in Australia and for certain provisional (temporary) visa holders who have skills in demand in Australia. EMPLOYMENT IS THE KEYIf you want to be in Australia as soon as possible, you need to have a job lined up for you. Click this link to find out how to show your Professional Profile on the AMES AustJOBS Talent Exchange site to improve your chances. To help our clients land a job in Australia AMES has formed an alliance with AustJOBS, an agency that focuses on matching prospective migrants with prospective employers who are interested in sponsoring international professionals and trades people. AMES is making membership of the AustJOBS Talent Exchange available to visitors to our Migration web site on a trial basis. Through this site you can now upload your Professional Profile to the AustJOBS Talent Exchange web site, where it can be viewed by Australian businesses looking to sponsor and employ someone from overseas who has the skills they are looking for.